← British Philosophy of ‘Race’: Oxymoron or Opportunity? 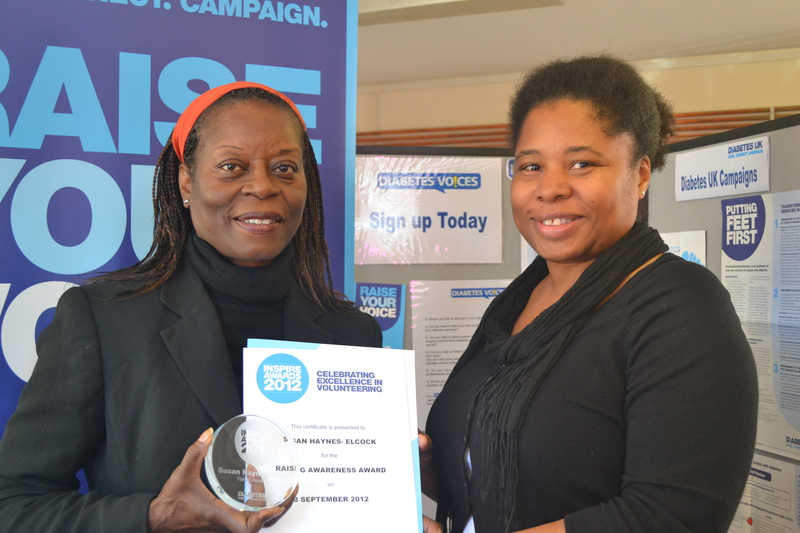 Attached is a photo of Susan on the LHS, receiving a Diabetes UK Inspire award at the end of the last year from Janet Alexander-Hall (on the RHS) who is Volunteer Development Officer for Diabetes UK in the Midlands. Susan Haynes-Elcock, from Wolverhampton, was diagnosed with Type 2 diabetes and found there was little advice and help available to support her during those first few months of coping with the condition. Since then she has set about sharing her diet and lifestyle changes with others to help them manage their diabetes successfully and recently published a cook book of adapted Caribbean recipes with the same great taste but reduced fat and sugar contents. The “World of Difference UK” Vodafone funding gives 500 people the chance to work for a UK charity of their choice and get paid for two months. Susan choose Diabetes UK because of the support the charity offered her after diagnosis and as an opportunity to increase the work she is already doing as a volunteer. “Getting it right in those first few months after diagnosis is so important, but it is difficult to know where to get advice and what to do. I am delighted to have won this funding so that I can work with a group of people in the Wolverhampton area, who have just been told they have diabetes, for this six week course. My plan is to meet informally at a time to suit the group and share my experiences and knowledge to get people on the right track of self-management from the beginning. This will include advice on diet, exercise and the best ways of coping with having diabetes. Susan will be working in partnership on this project with Saima Younas who is another Diabetes UK volunteer and has a Health Studies degree from Wolverhampton University and two other volunteers studying in Birmingham Muneeba Qayum and Harleen Sidhu. This entry was posted in Lifestyle & Health and tagged Diabetes UK in the Midlands, Type 2 diabetes. Bookmark the permalink.